Chocolate is one of the foods some people are still reluctant to pair with wine, in spite of the really interesting harmonies they offer together. Certainly not every wine can be combined with wine, but most of them are able to harmonize with cocoa, either bitter or sweet. The most interesting factor when pairing wine and chocolate is to keep in mind a couple of basic rules: the chosen wine has to be as sweet as the chocolate, and the fuller-bodied it is, the stronger the cocoa flavour should be. Sparkling and acid wines, e.g. champagne, will be harder to harmonize properly with chocolate, since cocoa excessively reinforces the acidity of this type of wines. Nevertheless, it is all about trying different harmonies. With red wines, achieving good harmonies is much easier. There are some excellent combinations of red wines and chocolate, either pure, white or milk chocolates. The white ones, which are more sugary and buttery, require sweet wines. The Syrah variety, for instance, can provide excellent harmonies in this respect, since it is a sweet and very tasty wine, as well as the Petit Verdot. When combining milk chocolate —either bars, mousses or creamy—, it is better opting for not full-bodied wines. Again, the Syrah variety may be a good option, as well as any Porto wine. Our MV, produced with Syrah, Tempranillo and Cabernet Sauvignon grapes, offers amazing harmonies with soft chocolates and mousses. 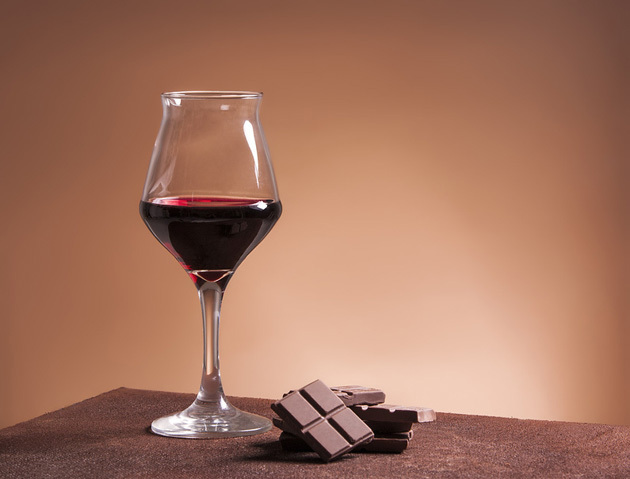 With pure chocolates, it is advisable to drink a more robust and full-bodied wine. The Cabernet variety perfectly harmonizes with this type of bitter chocolates. For our Cabernet Sauvignon, for instance, some harmonies based in pure chocolates with almost 75% cocoa content have been created, as well as for our Colección Privada. Remember: the bitterer and stronger the chocolate is, the fuller-bodied the pairing wine should be. And a last tip: if you look for a wine which pairs well with any chocolate, choose our Syrah Vendimia Tardía. It is a very special sweet wine, with a high concentration of sugar and a strong aroma, making it ideal to be combined with chocolate.